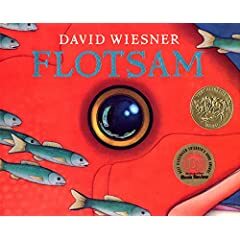 David Wiesner's newest book, Flotsam, is simply amazing. I would say that I loved reading it, but I didn't actually read it. There are no words. Only pictures that tell a story. And for some reason, the story is really powerful, even though it is rather nonsensical. The premise is that a boy finds a camera washed up on the beach and develops the pictures. He then returns the camera to the sea so that the adventures might continue. The artwork is simply amazing. With no words you might be tempted to complete the book quickly. Relish the details that Wiesner includes in each page. Just as the boy discovers hidden images in one of the photographs, so can you see all sorts of fantastic imagery if you take the time. For a book with no words, telling a story of nonsense and fantasy, and concluding with a rather simple premise, I still found myself strangely choked up when I completed the book. If you get the book, be sure to come back and post your thoughts of it here. From November through January I am scheduled to present an educational school assembly program called Arctic Express over 75 times. We already have 22 shows on the books for winter of 2007. Part of the reason the program is so popular is that in addition to being a reading program, it also addresses and teaches about the many diverse ways that people around the world celebrate holidays during the winter months. From Thanksgiving, Diwali, Ramadan, and Hanukkah to New Years and of course, Christmas. It is based on the story of a boy who had dreams and goals as a child that seemed impossible, but through determination and a constant belief in himself he was finally able to achieve his goals. The show ends with a very powerful emotional send-off that leaves everyone (students AND teachers) inspired to live each day to the fullest. I debuted this program in the winter of 2004. I performed it all over Texas, from Houston all the way to the Rio Grande Valley at the southern tip of Texas. The story in the presentation is about a boy who wants to create snow in the parts of Texas where it is too hot to snow. It snowed on Christmas morning in southern Texas. Not just in isolated places either. It snowed from Dallas/Fort Worth all the way down to the Rio Grande Valley. For those of you who live in colder states this might not seem so amazing, but in southern Texas, particularly down in Falfurrias, Victoria, and McAllen (just a few miles from Mexico) the very idea of snow is magic. And to have it happen on Christmas day is simply unbelievable. I know what causes snow. I know that my program had nothing to do with the snow. But if you’ve seen the Arctic Express program, you know that I sure like to believe that it did play a part.